Once notorious for our diet of meat and two soggy veg, we in the UK are now happily tucking into sushi, dim sum, tacos and fajitas, chorizo, bruschetta, tagines, baklava, guacamole, felafels and houmous (over 30 million pots a year from one supermarket chain alone!). All of this gives the lexicographer a bit of a headache. When do these foods become established enough to merit a place in the dictionary? After all, pretzels, ketchup and lasagne were considered ‘foreign’ once, but are now firmly part of the English language. As part of our work, my colleague Kate Woodford and I collect new words as they come into English (many of which you can find on this website). We don’t try to predict whether or not they will catch on, but just record them for future research. So I decided to look back at food words we captured between 2005 and 2010 to see which of them have made it into general use. The main contenders all come from the realm of so-called health foods. Quinoa (pronounced keen-wah), is a gluten-free grain now widely available in the UK, and edamame beans are green, undried soya beans. Acai berries from the Andes have become fairly popular, and manuka honey, thought by some to have healing properties, is now to be found on supermarket shelves. Probiotics and prebiotics are also commonly consumed by those seeking better digestive health. And what of current food trends? The US is usually ahead of the UK in this area, so the Taiwanese hirata buns (meat and pickles in steamed bread) that are just appearing in London are already popular there, as is kimchi, a Korean dish of fermented vegetables, for which Michelle Obama posted a recipe on Twitter last year. Stevia, a sugar substitute, is still not widely known in the UK, but played a clever and shocking role in the hit US series Breaking Bad. Both sides of the Atlantic have succumbed to the recent craze for hybrid cakes, such as the Cronut (croissant/doughnut), the crookie (croissant/cookie), the duffin (doughnut/muffin), the muffle (muffin/waffle) and the townie (tart/brownie). 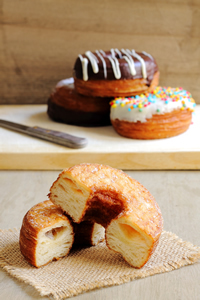 Sharp-eyed readers will note the capital letter on ‘Cronut‘ that is the result of the rather depressing scramble for trademarks which accompanied these creations. Globalization and easy travel are bringing ever more dishes onto our tables and into our language, but we still need French to wish one another bon appetit! Oh yes, In Britain, you eat aubergine and courgette, in America, we have eggplant and zucchini (or green squash).